Several universities have come under fire, after announcing they will be upping their fees to £9,250 - before the fee changes have even been fully-debated in parliament. The government announced in May that they want to link tuition fees to teaching performance. Universities that perform well would be allowed to raise their fees. If the bill passes, these universities would be allowed to raise their tuition fees in line with inflation. Durham, Kent and Royal Holloway, however, announced on their websites that their fees would be a higher £9,250 per year for undergraduates, before the paper has even passed through parliament. Durham, listing their fees as £9,250 for 2017/18. 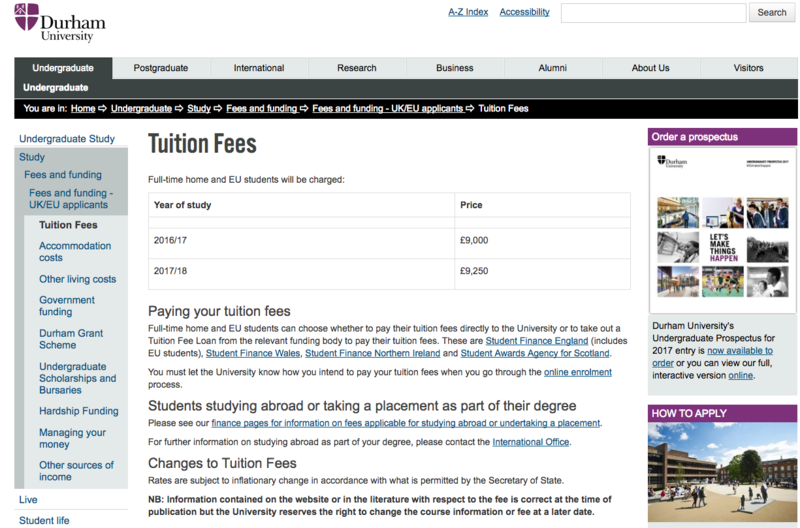 Bishop Grosseteste University, also listing their fees at the higher amount. The fee rises, which were debated in the House of Commons on Tuesday, have not yet been officially passed, and was not a "not a done deal" according to Liberal Democrat education spokesman John Pugh. "The real question is whether government is giving these institutions the green light to advertise higher fees," he said. "They've not even shown their plans for linking fee rises to Parliament. So why are they giving universities the impression that they will pass their teaching quality assessment?" "Those universities foolish enough to advertise higher fees will be doing nothing to quell concerns from students and parents that they are simply after as much cash as they can get." The NUS opposes the fee rises, and say they should drop the "muddled proposal". “Students will understandably be outraged at any suggestion universities could be allowed to put fees up even higher in order to improve teaching quality. It was only four years ago tuition fees were trebled and students now face debts up to £53,000 when they graduate," Sorana Vieru, NUS vice president (higher education), said in May this year. 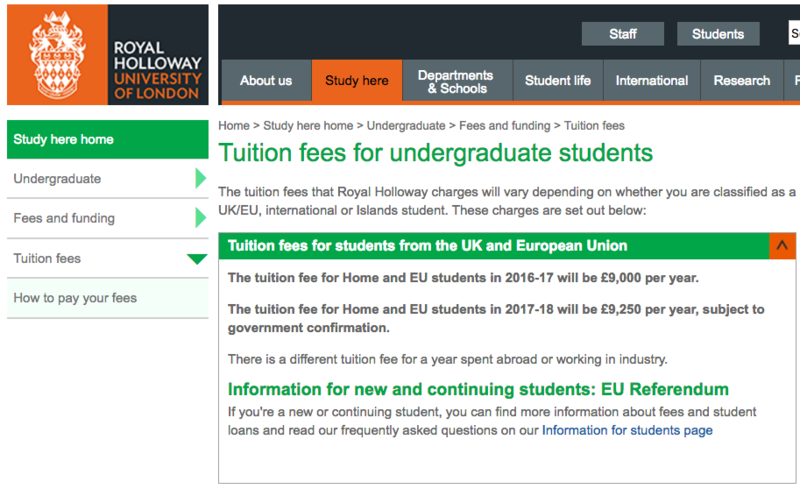 Royal Holloway write that the fee rise is "subject to government confirmation". Other universities around the UK, who haven't yet announced they are raising the fees, have put warnings on their websites that fees may increase each year in line with government policy. The government says that the bill will be properly debated in parliament before the changes are made, and argues that raising tuition fees will provide £11.6bn to universities. "This will rightly continue to require the same level of parliamentary scrutiny as before and the Bill will allow the maximum fee cap to keep pace with inflation," the Education Secretary Justine Greening told the House of Commons during the debate on Tuesday. Students from Scotland who study in Scotland still do not have to pay tuition fees, whilst Welsh fees are capped at £3,810 and Northern Irish fees are capped at £3,925.